Though I'm sure we all know what helps keep us on track we have listed some tips just to refresh our memories that can help us keep those New Years Resolutions that we have made... again. Look out 2015, I'm stronger than before. Is it deja vu or do I just keep making the same old resolutions to myself year after year? I know we're not alone as this is the time when we promise ourselves that we will change for the better. After all, it's a new year and with that we hope that improvements and good things will come our way, especially if we take the time and work at them. No matter what changes we have promised to make to better our lives, here are a few tips and suggestions that can actually help you to keep them. 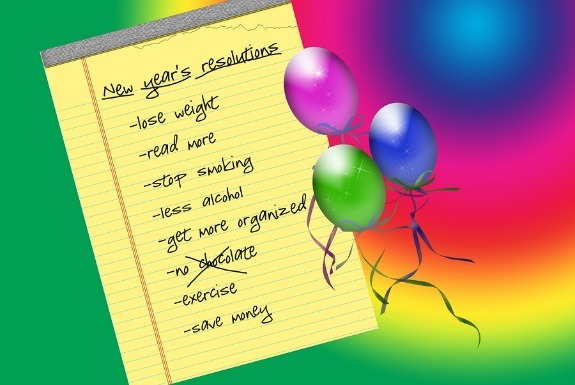 Keep New Years Resolutions with Tips That Can Actually Help You Succeed. The morale is, never give up no matter how many times you have faltered, because if you keep on trying there is always that chance you will succeed and will keep New Years resolutions, but without trying we have little or no chance to make the change we desire. No matter what your goal it is always nice to reward yourself for keeping focussed. After all, hard work deserves a treat or a mini celebration now or then. This is a no brainer and should be repeated often to remind us. Drinking water is a fantastic way to help fill a grumbling tummy and also helps us to detox, making us feel more energetic, less weighed down and helps increase our metabolism. When we have less food in our tummies our bodies are in cleaning mode. Toxins are being eliminated and calories are being burned. As mentioned above you can always have a glass of water to temporarily fill up and help avoid hunger until your next meal. Try to fill up on foods that are high in nutrition and low in calories. Lots of fruits, vegetables and lean sources of protein are key. I don't want to sound harsh but we have to stop eating anything we want at any time. This tip can be such a great time saver on those oh so busy days and also helps keep new years resolutions a little easier. Click Here to Print Your Copy of the Motivational and Goal Setting Worksheets. Wishing you success, but as always wishing you health and happiness.